Diamond - the famous and controversial gemstone known to all as the hardest natural substance - occupies a unique place in the gemstone world. 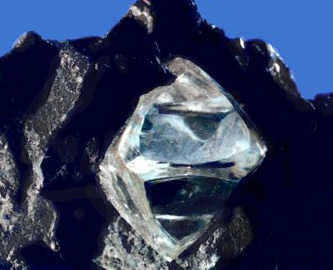 Comprised of pure carbon in an alternate structure to the black graphite most associate with the element, diamonds have a host of unique qualities. One interesting one is that they will vanish (oxidising to carbon dioxide) if heated to a high enough temperature. 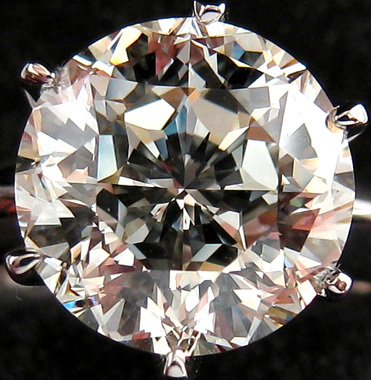 3.17 ct, "Gabrielle" round cut. 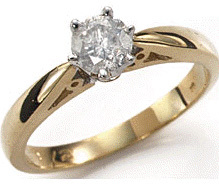 Diamond has a long history of use, with some sources suggesting that it has been in use even as far back as 6,000 BC. Diamonds were apparently first known and used in India, and were used in ancient times as religious icons and also as engraving tools. One of the most interesting and bizarre theories surrounding diamond was that of scientist and novelist Arthur C. Clarke - who proposed the idea that the core of the planet Jupiter may well consist of a diamond the size of the earth. It may be a while before the truth of this is ascertained - but at some point, owing to advances in science, the price of diamonds may fall: If they are able to be mass produced in large quantities at flawless quality, they will no longer be rare. An interesting type of diamond worth investigating is the black diamond - an ultra-rare form of diamond about which many mysteries remain to be solved. There is still no scientific consensus as to how the black diamond formed. The following quote is from "Antique gems: their origin, uses, and value" by Charles William King, 1866. "Under the Romans it was a well-known gem, and then, as now, "the most precious of all possessions." Before the age of Pliny it had been seen only on the hands of kings, and of but a few among them ; but the spread of commerce under the Caesars had by that time made the gem much more common. Six varieties were then known, of which the Indian, " sometimes as large as a hazel-nut kernel," and the Arabian were clearly real diamonds, as is shown by their peculiar form, described by Pliny as that of two whippingtops united at their broadest ends. Their silvery or steely lustre is also noticed, a striking peculiarity of the stone in its natural state. The Macedonian found in the gold-mines of Philippi was no larger than a cucumber-seed. The Cyprian, of a bluish tinge, "vergens in aereum colorem," and the Siderites, of a steel colour and very heavy, were doubtless sapphires, for they could be drilled by means of another Diamond. Pliny goes on to repeat the jeweller's fiction as to the infrangibility of the Diamond, a thing still believed in by most people, who cannot separate the ideas of hardness and of resistance to violence, and who do not choose to try so costly an experiment on any Diamond in their own possession. "But in reality, from the fact of this gem being composed of thin layers deposited over each other parallel to the original faces of the crystal, it can easily be split by a small blow in the direction of these laminae. This property may be exemplified by the following story. The London jeweller intrusted with the re-cutting of the Koh-i-noor was displaying his finished work to a wealthy patron, who accidentally let the slippery and weighty gem slip through his fingers and fall on the ground. The jeweller was on the point of fainting with alarm, and, on recovering himself, reduced the other to the same state by informing him, that, had the stone struck the floor at a particular angle, it would infallibly have split in two, and been irreparably ruined. A few particulars about this famous Diamond will not be out of place here. Tavernier saw it two centuries ago in the treasury of the Great Mogul, not many years after its discovery. Its weight in the rough, of above 800 carats (according to report), had been reduced to 284 by the bungling Italian lapidary who had brought it to the ugly and unskilful form in which it appeared when brought to this country. This was a rude hemisphere facetted all over, apparently intended for the rose shape. "The re-cutting in London was effected by the means of a small steam-engine, under the superintendence of two artists brought expressly from Holland, where alone the business is kept up. This operation cost 8000 pounds, and has brought the stone to the form of a perfect brilliant, with a wonderful augmentation of its beauty and lustre, though with a reduction of the weight to 180 carats. Even now it remains one of the largest Diamonds in Europe - Halphen's Star of the South weighing 244 carats; the great Russian 193; the Pitt or Regent of France 136 ; the Austrian, a yellow stone, 139 ; and Hope's blue Diamond, the most beautiful, though least valuable of all, 177. The art of cutting and polishing this gem was only discovered in the fifteenth century by Louis de Berghem, and the first ever cut by him was a large one belonging to Charles the Bold, and weighing 55 carats. 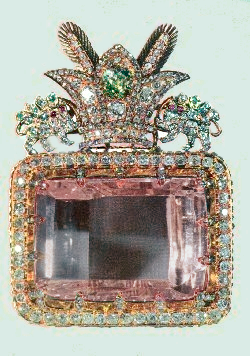 It is now known as the Sancy diamond, which, having been found on his corpse on the field of Granson, was sold for a few francs, and, after passing through innumerable vicissitudes (having once been swallowed by a faithful servant when beset by robbers, and afterwards extracted from his dead body by his master), now reposes amongst the French regalia. Vossius says, the largest Diamond known in his time, the end of the sixteenth century, was that bought by Philip II. of Carlo Affetati, of Antwerp, in 1559, for 80,000 crowns. Its weight was but 47 1/2 carats. It was then a prevalent opinion that the stone lost its lustre by too much warmth, whence persons on going to bed used to place their diamond rings on a marble-table, or in a glass of water. "It is said that the Austrian Diamond was originally bought for a mere trifle at a curiosity-shop at Florence, being considered merely a yellow crystal. Brazil furnishes a vast supply of these yellow stones, the most unpleasing of all the tints the Diamond assumes, for to my taste the pink and blue varieties are much superior in beauty to the colourless. "The ancient Indian mines of Golconda and Cooloun (where at the time of Tavernier's visit more than 60,000 men, women, and children were employed in the various operations of the search), in the Madras Presidency, have long since been exhausted; the only source of the supply at present is Brazil, and even there the tract containing the gravel (cascalhao) in which they are found is nearly worked out. But I have little doubt that in a short time the market will be flooded with an importation of this gem from Australia, even greater than that which took place on the first discovery of the Brazilian mines. As in that region they were accidentally discovered in the search for gold, so in Australia a few have already made their appearance under similar circumstances ; one of which, as well as a Sapphire from the same locality, has been deposited in the Museum of Geology, Jermyn-street. And this important discovery will doubtless take place when the gravel of the Australian diggings comes to be turned over by persons having eyes for other things besides gold flakes and nuggets. "The observation made of old by Pliny, that the diamond always accompanies gold, has been fully borne out by the experience of succeeding ages, for in most deposits of alluvial gold have they been found in greater or less abundance, even in Wicklow and in Cornwall. This stone is highly electric, attracting light substances when heated by friction, and, as we have already noticed, has the peculiarity of becoming phosphorescent in the dark after long exposure to the rays of the sun. The ancients also ascribed magnetic powers to the Diamond in even a greater degree than to the loadstone, so much so that they believed the latter was totally deprived of this quality in the presence of the Diamond; but this notion is quite ungrounded. Their sole idea of magnetism was the property of attraction; therefore, seeing that the Diamond possessed this for light objects, the step to ascribing to it a superiority in this as in all other respects over the loadstone was an easy one for their lively imaginations." Estimated at 186 carats, pale pink, 41.40 mm in length, table cut. Crown Jewels and its name means "Ocean Of Light". Uncut Diamond Rough diamond still in its matrix. Hershey, W. (1940). The Book of Diamonds. New York: Hearthside Press. pp. 22–28.